I have always liked having all my keys on one key ring. With just one key ring, it’s hard to forget a key or grab the wrong set of keys. But there are times when I need to take just a car and house key with me in my pocket or evening bag or when I’m going out walking, I just need the house key not the entire bulky key ring. A while ago, I got tired of fussing with the big, bulky, tangled key chain and fighting with it when I needed to get a key off of it. 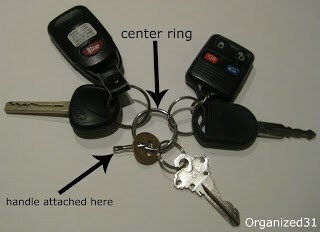 That frustration is long gone since I figured out a quick and easy way to set up my key ring. Each car key and fob is attached to its own ring and the house key is attached to its own ring. Then each of these 3 rings are attached to a central ring. 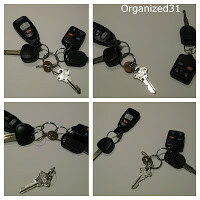 This way the keys don’t get tangled with each other and it’s easy to locate which key you want. With each set of car keys coming off the central ring, it’s easy to detach different combinations of keys; just one set of car keys, just the other set of car keys, just the house key, or a set of car keys and the house key. This same configuration worked great when I had office keys on my key ring. The office keys were on their own ring attached to the central ring. That way it was easy to remove the office keys when I didn’t need them on the weekend or on vacation. It was just as easy to carry just the office keys in my pocket at work and leave my personal keys with my purse. This configuration is so easy and works great no matter how many keys you have. Give it a try and see what you think. I have done something similar but used a carabigner (I don’t think that’s how you spell it. The clips you use for rock climbing) instead of the center ring. Super easy to get them on and off that way! And you can drive with only the set of keys you need in the ignition, which is far better for your car :). Hth! I do this too, except that my “center ring” is a carabiner. It’s easy to open to remove key sets, and it also makes it easy to clip onto my purse so I’m not hunting keys in the bottom of the purse.